Cultural experiences and activities are abundant in eastern PEI. The eastern end of the Island offers its own brand of “Down East” culture and experiences that include theatre, Ceilidhs, artisans, museums, six lighthouses open to the public, and over "50 Phenomenal Beaches". Here, you can also explore the history of the Island’s vanished railway, bike the Confederation Trail, fish for giant Bluefin tuna or learn how to dig bar clams or tong for oysters. Experience artisans and craftspersons at work in beautiful coastal towns. If you plan to take the ferry from Nova Scotia to PEI, the Points East Coastal Drive is where you’ll arrive. Download our free mobile app. 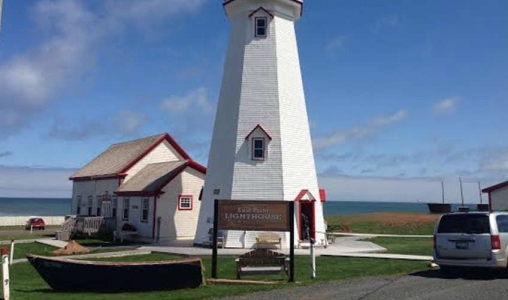 Make your visit to Canada's Confederation Lighthouse complete with a visit to the lighthouse craft shop. We represent over 70 Island artisans and many regional crafts people. As well, we offer the Island's largest selection of lighthouse keepsakes. We have jewelry, books, knitting, sewing, pottery, woodwork, music, prints, original paintings, PEI food products, and so much more!